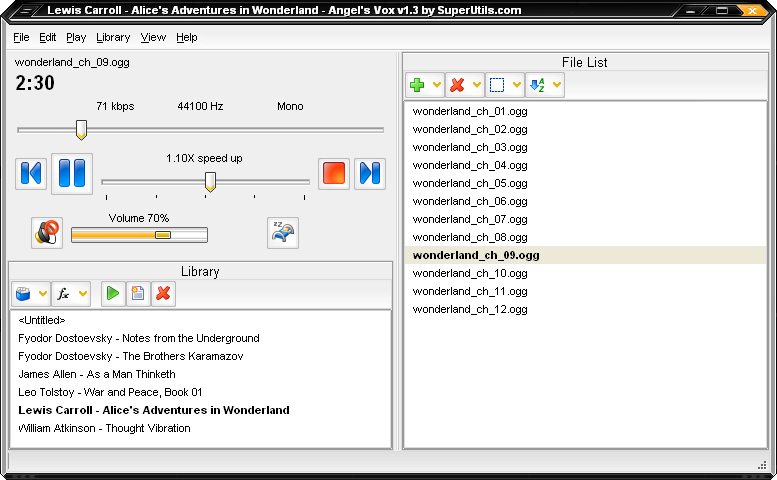 Angel's Vox is the first software player designed specifically for audiobook enthusiasts. Angel's Vox saves volume level, playback speed, last played track and position for each audiobook in the library. Calculates time played stats, has a sleep timer feature. Like other media player programs, Angel's Vox can also be integrated into Windows Explorer shell for quick access to its major functions. 30-days trial version is available for you to try. The first audio player designed specially for listening to audio books. ...... g., when you are learning a foreign language)? Angel's Vox is an innovative and handy solution! With the help of Angel's Vox, you can maintain a library of your audio books. You can configure a different volume level and playback speed for each one, and their settings will be restored when you replay them. * Supports both MP3 and OGG audio file formats. * Angel's Vox can speed up playback to save your time or can slow it down if you cannot recognize the speech (may be useful when you are learning a new foreign language). * Saves a volume level, playback speed, last played track and position for each audiobook in the library. * Angel's Vox has a sleep timer feature: you can shutdown, reboot or log off Windows in the specified time. Besides, this utility allows you to lower the volume level progressively at the end of a period. Do you dream to see a angel? Now quickly download this wallpaper. Angelina Jolie Free Screensaver. Photos slideshow. Collected poetry of all types. A great collection of Angela Lindvall's pictures in screensaver format. Qweas is providing links to Angel Vox 1.5 as a courtesy, and makes no representations regarding Angel Vox or any other applications or any information related thereto. Any questions, complaints or claims regarding this application Angel Vox 1.5 must be directed to the appropriate software vendor. You may click the publisher link of Angel Vox on the top of this page to get more details about the vendor.